Ultimate Burger Builder Winner - Jamaica It Urself!See our latest ultimate burger builder, winning burger! 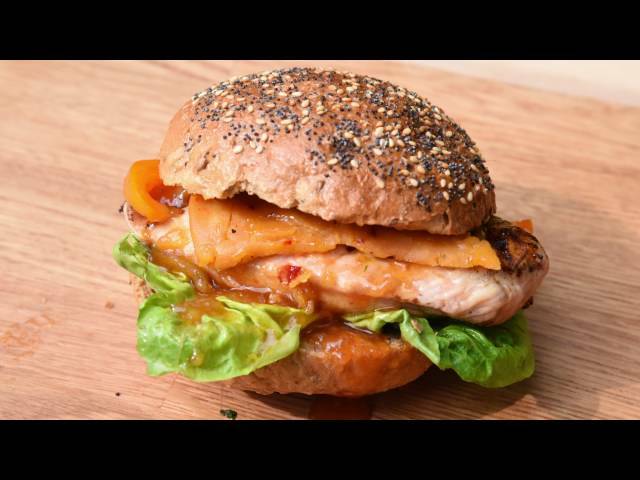 Ultimate Burger Builder Winner – Jamaica It Urself! Tired of the same-old BBQ recipes? Looking for something a little exotic to liven things up? We’ve got just the thing right here – quick and easy BBQ food that’ll take your taste buds on a far-flung adventure! Just a few simple ingredient-swaps transform an everyday burger into something seriously special. Yet more proof that even the most effortless and cheap BBQ recipes can be made quite remarkable with a little imagination! So if you can’t quite stretch to taking your guests to the Caribbean, why not bring a little of the Caribbean to your guests? Grill a chicken breast over a medium-hot BBQ until fully cooked but still juicy. Smear a good layer of mayonnaise on the bottom half of the roll, before adding the lettuce, grilled chicken, spicy cheese wedge and orange pepper slices. Top with the other half of the roll, generously coated in a thick layer of sweet mango chutney. Serve hot and gooey with plenty of napkins – this little lovely tends to get a bit on the sticky side!